Today’s Flash Back Friday comes from Episode 33, originally published in September 2010. Jason Hartman talks with Peter Yanev who has more than forty years of experience in earthquake and structural engineering, and risk management. In 1981 he co-founded EQE International, a global risk management provider, and grew the company to 750 professionals before leaving in 2001. He currently advises organizations worldwide, including engineering firms, the World Bank, the Massachusetts Institute of Technology, and the University of California, Berkeley. 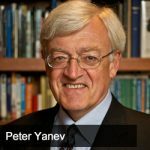 A former president of the Northern California chapter of the Earthquake Engineering Research Institute, Yanev has performed more than one hundred earthquake investigations, has published extensively, and is a frequent media commentator on natural disasters. He holds degrees in structural and earthquake engineering from the University of California, Berkeley, and the Massachusetts Institute of Technology. He lives in Orinda, California. Some topics covered in this episode are: Supplies of food and water is not preparedness – safety is of course a concern but the real problem is what happens to your home, business, and investment. What can you as a homeowner do? What about the small business owner? Is insurance the right solution? Should you retrofit? Or do both? How can a home or business owner do some simple risk planning to help understand their risk? The same issues apply more to apartment and condo owners especially those who are buying in new buildings – do they understand that the code is not meant to protect their investment (or business) and that it only means the building won’t kill you? Your building or home still might be destroyed. Do they understand that many new buildings are unsafe from a risk perspective? We can elaborate on what the code means and what people should know about it – specifically what you should know if you plan on building or investing in real estate (home, office, etc). About the book Peace of Mind in Earthquake Country, the best-selling book which for thirty years has helped homeowners everywhere protect their properties and loved ones from the devastating effects of earthquakes, is now completely updated and greatly expanded. The new edition reflects the latest advances in earthquake science, engineering, and financial management techniques for homeowners, home buyers, and businesses in earthquake country.